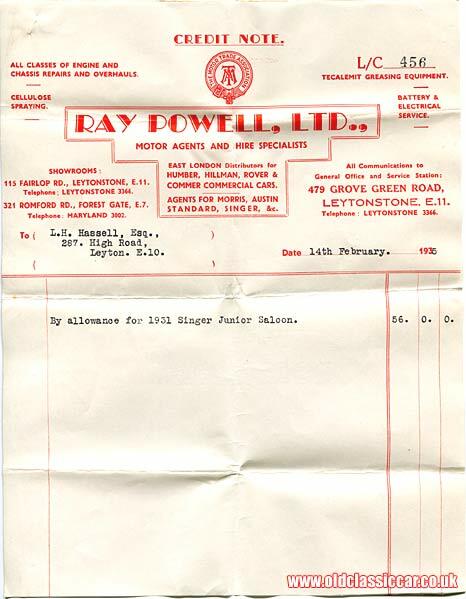 Sale of a 1935 Wolseley Nine at Ray Powell Ltd of London. Homepage. This page: Paperwork for the purchase of a 9hp Wolseley motor-car in 1935. By the time that the 1970s had rolled into view, Ray Powell Ltd were occupying a spacious garage in Tottenham Hale (a poster featuring their establishment can be seen on this page of the site). These documents though are from the pre-war era, 1935 to be precise, and relate to the part-exchanging of a 1931 Singer Junior against a brand new Wolseley 9 saloon by the Hassell family. Two photographs of the 1930's Singer can be seen here. The Wolseley was bought in February 1935 from Powell's dealership in London. The paperwork lists three separate addresses for this large firm: Fairlop Road (Leytonstone), Romford Road (Forest Gate), and Grove Green Road (Leytonstone), the former two premises being showrooms, while the latter was their head office and service station. 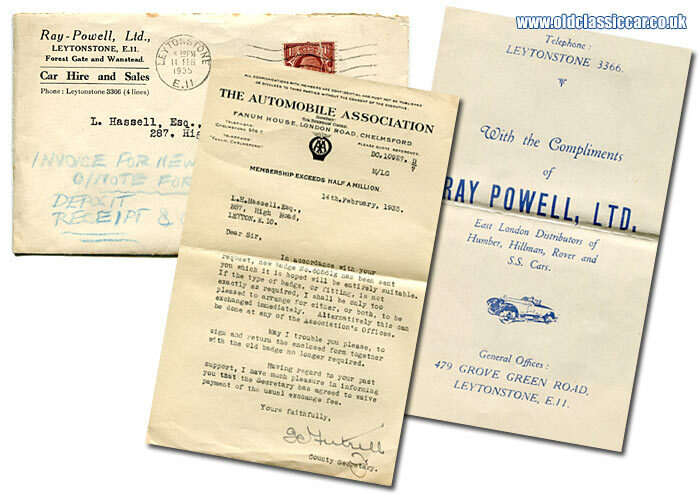 These items of paperwork record the purchase of the Wolseley, and also document the new owner's correspondence with the Automobile Association (AA), from whom a new member's badge had been ordered. The order form for the Wolseley was handwritten - in pencil - on 8th February 1935. Finished in green with matching upholstery, the base price of the car was £184 0s 0d, which once a few extras had been added, came to £187 19s 9d. As the '31 Singer was being part-exchanged against the Wolseley, an allowance of £56 0s 0d was made, bringing the total payment down to £131 19s 0d. A number of terms and conditions are described on the reverse side of the order form. They cover the purchaser should any woes be encountered with their new vehicle, and if the price of the vehicle should go up in between ordering it, and making final payment. One condition that I've not heard of before was a clause whereby the purchaser must agree to "... not exhibit any of the goods at any Exhibition in the United Kingdom, or enter it in any competition prohibited by the Society of Motor Manufacturers and Traders Ltd". How enforceable would this have been? Despite the number of documents recording the sale of this car, not one mentions its registration, as a result its identity will remain a mystery. On 14th February a credit note acknowledging the inclusion of the Singer in the deal was typed out on Ray Powell Ltd paperwork. The firm was East London distributor of Humber, Hillman, and Rover cars, in addition to being approved agents for Morris, Austin, Standard and Singer cars. They'd also be happy to supply new Commer commercial vehicles, while servicing was also on offer. 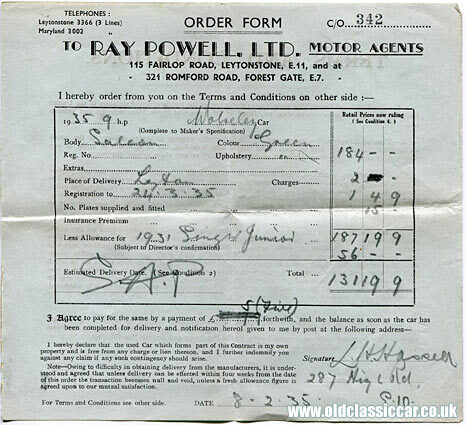 The final invoice for the car is in a similar style to the credit note shown above, although it also refers to the products of SS, Studebaker, Daimler, Lanchester, Riley, Triumph and Vauxhall in its heading. 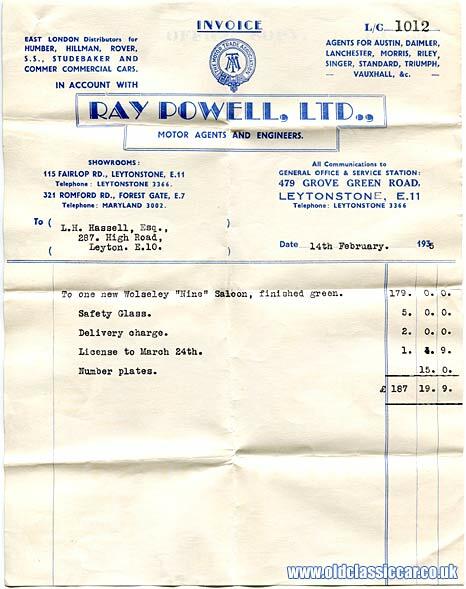 An extra £5 was charged for "safety glass", with fifteen shillings being added for number plates, and a further £2 for delivery to Mr Hassell's residence at 287 High Road in Leyton. What of the addresses that are included in the company's letterheadings? 115 Fairlop Road in Leytonstone appears to have been used in recent times by Leytonstone Station Cars, but other references are vague at best. There is though a photo of the site c1990 on this flickr page. 321 Romford Road in Forest Gate is in use with a business called Pindi Motors, while I've not been able to confirm the current status of 479 Grove Green Road in Leytonstone, the location of Powell's office and service station. 287 High Road in Leyton, the address of the Wolseley's new owner in 1935, is now a retail location with a flat above it. In recent years it appears to have been a photo studio, and also a surgery. My thanks to Tamara for sending over these documents.